Cloudcroft, N.M., holds more than one important distinction. It is home to the nation’s highest golf course at 9,000 feet, and its residents have implemented an integrated water conservation and indirect potable reuse project to supplement spring and well water with treated wastewater effluent. Faced with a drought that necessitated trucking in 20,000 gallons of water up the mountain each day during the peak summer tourism season, the 1,000 residents quickly let go of any concerns about using recycled wastewater. From the state’s $10-million initiative to promote innovative water conservation, the village received $600,000 in 2004 to help fund the village’s new $2-million water reuse system. The state-of-the-art system employs a second-generation membrane bioreactor (MBR) and a gravity-fed reverse osmosis (RO) system to treat wastewater flows that ultimately exceed drinking water quality standards. For the most part, the treated effluent is discharged into a man-made reservoir. What makes Cloudcroft unusual is that this reservoir serves as a raw water source for the town’s drinking water treatment system. The village implemented a system that shortens the distance – and traces an obvious path – from the wastewater treatment discharge point to the intake point of the potable water treatment system. At Cloudcroft, public concerns about water quality are understandable, as the origin of the drinking water is clearly identifiable, the intervening time is relatively short, and the proportion of recycled water is relatively high. The purified wastewater constitutes up to 50 percent of the drinking water supply. The effluent from the reclaimed wastewater treatment plant is pumped into the reservoir, where it is mixed with well and spring waters. Prior to intake into the potable water treatment system, the reservoir water is stored an average of 30 days for natural treatment by diffusion and sunlight. The use of an artificial reservoir and the blending with well and spring waters classifies the integrated water treatment as an “indirect planned potable reuse” system. Livingston Associates of Alamogordo, N.M., engineered the project's design. Key elements of the system are the MBR and RO membranes supplied by Koch Membrane Systems. These membranes will make the effluent discharged into the reservoir safe for human consumption. The integrated water treatment process also includes an ultrafiltration (UF) system to treat the reservoir water (a mix of treatment plant effluent and well and spring water), an increasingly common treatment method for treating surface water. The project involves the conversion of the original wastewater treatment plant to an MBR process. The MBR is designed for an average flow of 100,000 gallons per day (gpd), with room for an additional 100,000 gpd in the future. The retrofit of the 200,000-gallon equalization basin is being accomplished by dividing the facility into two equal compartments: one for flow equalization and the other for the MBR. 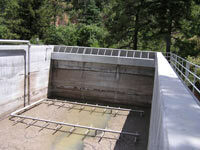 Raw wastewater influent will enter the system and pass through a 1-mm rotating drum screen at the headworks. The screened influent will flow by gravity to the equalization basin, before being pumped into the anoxic basin. From there, the flow enters the aeration basin to receive aerobic treatment, and then enters the four membrane chambers that house PURON™ submerged membrane modules. The MBR system will produce a high quality effluent with turbidity typically less than 0.2-Nephelometric turbidity units (or 1.0-mg/L total suspended solids). The filtrate will be disinfected with chloramines and pumped to a new 75,000-gallon water storage tank at the plant site. The PURON system uses a single header with hollow fibers that are fixed only at the bottom. The sealed upper ends of the fibers are allowed to float freely, eliminating build-up of hair and fibrous materials at the upper end of the tip. Solids and particulates, including bacteria, are rejected by the membrane and remain on the outside, while permeate is drawn through the membrane to the inside of the fibers. Outside-to-inside technology provides optimal solids management and a high flow-rate. The MBR is the first step in a multiple physical-barrier approach to reclaimed water repurification. The MBR permeate will be pumped uphill into a 75,000-gallon storage tank. From there, some of the water will be diverted for non-potable reuse (to irrigate the golf course and high school athletic fields). Each day, 100,000 gallons will flow downhill about 2.5 miles to the water treatment facilities that house the RO system. The force of gravity produces approximately 175 pounds per square inch of residual pressure at the terminus of the 4-inch waterline – the pressure required to operate the RO system. The RO system is a single train, three-stage, one-pass system with five pressure vessels set up in an 2:2:1 array that contains Magnum® 8822HR membranes. These high-rejection, low-pressure thin-film composite membranes have been successfully utilized in reuse applications, and they have been shown to be effective in rejecting many emerging contaminants while achieving water recovery of about 80 percent. The RO system will produce an average of 80,000 gpd of permeate, with a total dissolved solids (TDS) content of about 50-mg/L from a feed quality of around 1,000 mg/L TDS. The system will apply peroxide and UV for RO system permeate disinfection. From there, the treated water will be discharged into a 1-million-gallon lined and covered reservoir. The reservoir water will flow into a 750,000-gallon covered and lined reservoir, where it will blend with existing spring water and groundwater. A portion of the RO permeate will be used for aquifer recharge during times of low water demand. The concentrate from the RO process will be diverted to a 250,000-gallon open and lined reservoir along with UF backwash water. This water is to be used for road dust control, construction, snow making for the ski area, gravel mining operations, forest fire fighting, and other beneficial purposes. The final stage of the integrated water treatment is UF. Each day, approximately 180,000 gallons of blended water will be treated through the UF system. The permeate from this system will be filtered by granular activated carbon prior to receiving additional disinfection using sodium hypochlorite. The disinfected water will then go into the water distribution system. Because the high-quality (low TDS) water from the RO process is to be used for blending, the overall water quality in the distribution system is expected to improve when Cloudcroft begins using reclaimed water. The integrated membrane system and its multiple physical-barriers provide protection that will give the residents and tourists in Cloudcroft the confidence to enjoy high-quality, high-tech water as pure as a mountain stream.